Achilles tendinitis is a severe medical condition when the tendon that connects your calf muscles to your heel inflames or tears. While resting is the most recommended home treatment for a painful Achilles tendon, wearing a supportive shoe that relieves pressure off of the heel will help alleviate your pain as you recover. Running shoes most commonly have this protection, but what about non-athletic shoes? Many designs have shock absorption to take stress off of your joints, with extra comfort for men and women who walk or stand for long hours. 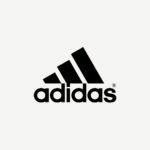 From casual walking shoes to dressy attire, we’ve reviewed the best shoes for Achilles tendinitis. For a basic shoe to get you through your healing process, the Skechers Performance Men’s Go Walk 4 Incredible is a walking shoe that is comfortable enough for all-day wear. The breathable mesh upper expands as you walk without weighing down your foot. Under the rubber outsole, Goga pillars have extra shock absorption under the heel and the ball of the foot, two areas that take the most abuse during running and walking. A tapered 5GEN midsole above the outsole has the right amount of bounceback to put more spring in your step. The technology behind the midsole combines cushion with response for more energy return. A hole in the back of the heel helps you pull the shoe on without bending or lifting your leg to tie your shoes, which can stretch your sore Achilles tendon. With no break-in period, the budget-friendly Skechers Go Walk 4 Incredible are comfortable to wear through the whole day without any pain. Although this shoe has many benefits for someone suffering from Achilles tendinitis, it is not for everyone. There is a significant difference in the design of the Go Walk 4 compared to the Go Walk 3. This version has a higher heel cup, which may or may not aggravate your condition. The padding seemed less springy in the insole, with little arch support, but it is removable for a gel insert. These shoes run narrow with a tight toe box, so if you also have other foot conditions, we recommend a wider shoe. While the rubber outsole won’t last on rougher terrains, the Skechers Go Walk 4 Incredible Walking Shoe is our choice for the best men’s shoe for Achilles tendinitis. The shock absorption in the Goga pillars and the midsole combined with a more defined heel cup give you the most comfort and support to help relieve your pain. Women suffering from Achilles tendinitis may struggle to find a supportive shoe in the heel area. Most manufacturers do not consider the biological differences between a man’s foot and a woman’s foot. Instead, they make women’s shoes about a size and a half smaller than their male counterparts. Fortunately, Brooks understands that women’s feet are different than men’s feet. The Brooks Women’s Addiction Walker Walking Shoes includes the company’s engineered BioMoGo midsoles with gender-specific features. Overpronators with an Achilles injury will love the Rollbar technology of the Addiction Walkers. Rolling your feet inward as you walk or run will irritate a tender Achilles tendon. The roll bar holds your foot straight, alleviating the stress on the injured area. It also improves your gait for better foot health. Brooks studied the contours of a woman’s foot for the BioMoGo DNA features of the midsole, which provide more shock absorption and energy return. Although the Brooks Addiction Walker has amazing cushion for long work days with standing or walking, they have little arch support. They are better for women with low to medium arches. This model runs narrow with a small toe box, so adjust your size depending on how loose you like your fit. There is a mild break-in period for the shoe, during which the leather upper needs to stretch to your movements. Although the Brooks Women’s Addiction Walker is an expensive walking shoe, the overall improvement they offer for the health of your feet makes them our choice for the best women’s shoe for Achilles tendinitis. What if you need a slightly dressier shoe without losing the casual style? The CLARKS Men’s Portland 2 Tie Casual Shoe is a dynamic shoe that you can dress up or down. Perfect with slacks or a pair of jeans, the Portland combines style with comfort. The rubber outsole with a 0.5” platform and 1.5” heel absorb impact as you walk. This keeps pressure off of your tendon with every step. A mesh interior lining keeps your foot comfortable all day, and the padded ankle collar holds your ankle in place without rubbing or irritating the area. The comfortable Ortholite insole is removable if you have a medical orthotic or you require more cushion for your sensitive feet. The CLARKS Men’s Portland 2 Tie Casual Shoe runs wide, but they have a large toe box. With more room for your toes to naturally separate during each step, you put more weight on the ball of your foot instead of your heel. As comfortable and attractive as they are, this expensive shoe is better for occasional use. The sole’s impact absorption wears down after about a year of everyday wear. Using these shoes occasionally will lengthen their lifespan. There is a mild-break in period for the leather upper, but the heel support and shock absorption of the outsole will protect your Achilles tendon from further rupture. 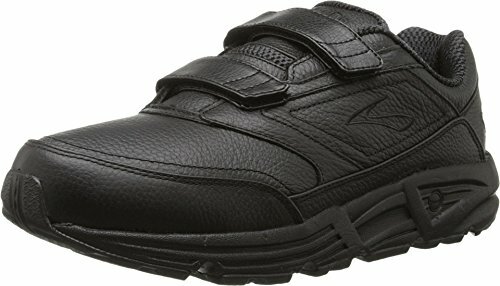 The Brooks Men’s Addiction Walker is also an excellent shoe for men with Achilles injuries. With its engineered support to diffuse impact away from your heel, they will help you heal faster. 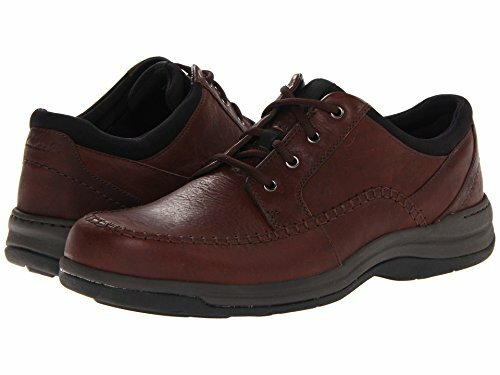 They also match most uniform requirements, making them a great work shoe for men with low arches. Overpronators often have trouble finding a corrective shoe for their tendency to stand on the insides of their feet. These shoes often feel heavy and bulky, and they have the obvious appearance of an orthopedic shoe. The Brooks Men’s Addiction Walker has the support of an orthopedic without the look. The Rollbar technology inside of the structure of the shoe faces your ankle forward for even weight distribution. This will relieve extra stress off of your heels. The BioMoGo midsole is designed for a man’s foot, giving energy return and bounceback in the right places to keep more weight on the forefoot. There is a mild break-in period for the Brooks Men’s Addiction Walker, but the leather upper will stretch to your movements. They run narrow with a small toe box, so order a size up if you want a roomier fit. These shoes may seem expensive, but compared to other orthotic shoes that offer the same protection, they are relatively cheap. Oversupinators who walk or run on the outsides of their feet also need a supportive shoe to get them through their Achilles tendinitis. Any extra weight on the sides of the feet, whether on the inside or the outside, stretches the tendon, which can cause further damage. The CLARKS Unstructured Men’s Un.Ben Casual Oxford has a slightly dressier look than the Portland, for men who wear suits to work. However, they are still casual enough for a pair of jeans. 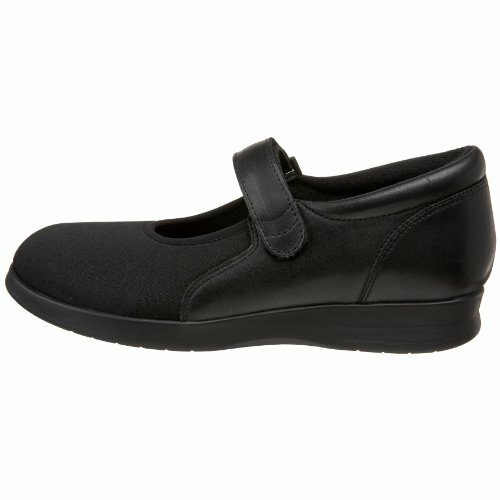 With a removable insole for a medical orthotic, this shoe is comfortable enough to wear all day. The 1.25” heel absorbs shock when you land, relieving pressure off of your heel. The defined heel straightens the gait of oversupinators for more pain relief. Extra cushioning in the hell and the ball of the foot in the midsole and the insole keeps the shock of landing on hard surfaces through your natural stride from affecting your Achilles tendon. With no break-in period, these dressy shoes are comfortable right out of the box. They breathe well, keeping your feet dry during long hours on your feet. The roomy toe box allows you to splay your toes when pushing off of the ball of your foot, giving you more leeway to put more weight on the forefoot. The CLARKS Unstructured Men’s Un.Ben Casual Oxford runs large and wide, with enough room for a comfortable fit without too much slide. Some buyers may turn away from their price tag, but this CLARKS shoe is a well-made leather oxford with a timeless look and incredible foot support. Your Achilles tendinitis doesn’t need to derail your love of the outdoors. The Dr. 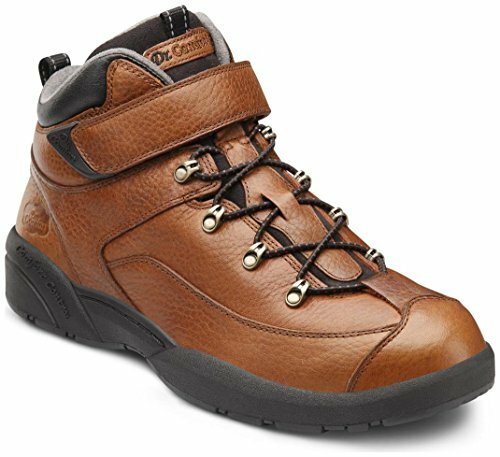 Comfort Ranger Men’s Hiking Boot is a lightweight hiking boot for men with special foot needs. Not limited to heel conditions, this hiking boot works for a variety of foot issues, such as neuropathy, plantar fasciitis, and bone spurs. The 100% full-grain leather upper has no-tie elastic laces with a Velcro strap at the top of the forefoot for better weight distribution across the whole foot. The extra padding around the heel cradles the back of the foot during your frequent bouts of pain. The Dr. Comfort Ranger Men’s Hiking Boot is expensive, but it helps you stay active through your Achilles tendinitis. It comes with two insoles: a flatter one for everyday wear, and one with thicker padding for days that you need extra cushion. Both of these insoles remove for room to place a medical orthotic. There is little arch support in the insoles, so you may have to invest in a few good ones if you have high arches. While the rubber outsole has good tread, it is thin without defined lugs that will hold up to slippery conditions. They run large, to accommodate swelling and other complications from foot conditions. Their unique design centers your weight towards the forefoot, taking the most pressure off of your heel so that your Achilles tendon will heal properly. In a slightly different design from the Men’s Go Walk 4 Incredible, the Skechers Performance Women’s Go Walk 4 Achiever Walking Shoe has the same advantages as the men’s model. 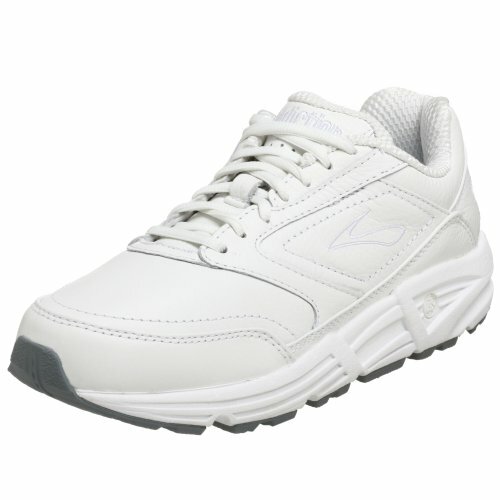 It is a moderately-priced and lightweight walking shoe for a variety of activities. From walking the dog to a long day at work, this shoe gives your heel the support you need to treat the tenderness and pain of Achilles tendinitis. With a breathable mesh upper that form fits your foot and expands with your movement, the Women’s Achiever doesn’t have the weight of other supportive shoes that may worsen your condition. A shock-absorbent midsole and insole with solid bounceback make this simple walking shoe effective for long periods of standing or walking. The 5GEN midsole has the response you need to keep most of your weight off of your heel, the tapered design focusing your step on the forefoot. Goga pillars absorb the most impact off of your heel and forefoot for a smoother walking experience. 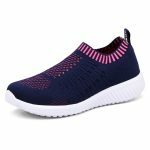 This relaxed slip-on shoe has a convenient heel hole for quick slip-on without unnecessarily stretching your tendon to tie your laces. 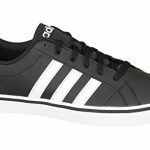 With no break-in period, you will love how comfortable and supportive these shoes are as soon as you put them on your feet. However, they do run narrow, and they don’t have much toe room. For women who like a close fitting shoe, this is more of a benefit than a drawback. If you have high arches, you should replace the insoles with a more supportive gel insole that will put more cushion under the heel and the forefoot. Best for walking on light terrain, the Skechers Performance Women’s Go Walk 4 Achiever Walking Shoe diffuses impact from your whole foot, with the extra bounce that you need to pull resistance away from your heel during your Achilles injury. 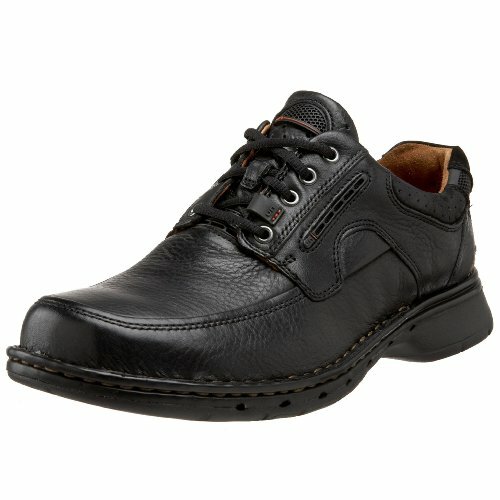 The decent price tag combined with the comfort will make it your “go-to” shoe for work or play. When you need to dress up, you can’t wear your walking shoes with your nice outfit. Most sandals have adopted the flip-flop style, with little support for the heel and the back of the foot. 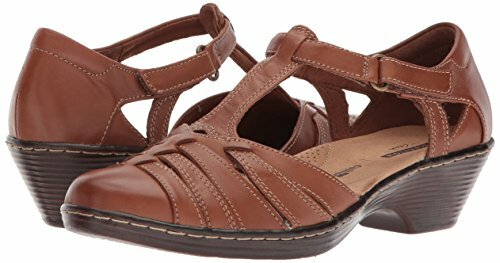 The CLARKS Women’s Wendy Alto Fisherman Sandal has the protection of a closed-toe shoe with the appearance of a cute sandal. This 100% full grain leather sandal has a defined heel cup with a low heel to put more balance on the ball of your foot. These elegant shoes match a pair of jeans or slacks equally well. The Ortholite insole helps your feet remain comfortable and dry, with a cushion under the high-impact areas of the foot. To make the sandal easier to put on, especially through an Achilles injury, a hook and loop Velcro strap fastener is more convenient than a buckle. It is easier to adjust, avoiding you from putting pressure on your heel when you need to tighten your shoe. Women with Achilles tendinitis or other heel sensitivity issues are surprised that this cute sandal has no break-in period. Unfortunately, they do run narrow with a tight toe box. The insole isn’t removable, so this sandal is designed for women with medium to low arches. 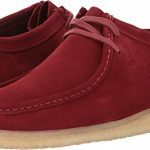 The top of the CLARKS Wendy Alto runs high on the ankle, which can irritate some women. If you have a thicker foot, this is not the shoe for you. It may fit tight across the forefoot, making them uncomfortable. Overall, the moderately-priced CLARKS Women’s Wendy Alto Fisherman Sandal is a stylish option for women who want to look their best as they adjust to their heel soreness from Achilles tendinitis. Mary Janes are a classic women’s shoe that never goes out of style. The Drew Shoe Women’s Bloom II is a cute Mary Jane shoe designed for women with foot issues. For better midfoot and heel support, the 100% Nubuck leather surrounds the foot from the ankle to the heel. This provides an anchor to support your ankle during every step. With a 1.25” heel, the Bloom II absorbs shock while pushing your balance to your toes. A fabric toe box wraps around the toes if your feet are prone to swelling, making these an excellent shoe for a variety of foot conditions. An adjustable hook and loop strap makes them more accessible than the traditional buckle design. The Drew Shoe Dri-lex moisture-wicking technology inside the shoe keeps your feet dry and reduces odors for all-day comfort. The heel support on this shoe is unparalleled among the dressier shoes on this list. Steadying the back of your feet, the shoe doesn’t irritate your sore heels. The design of the Blooms is best for women with wide feet, but they suit women with any range of arch. Two removable insoles come out for a medical orthotic, or you can leave one or both of them in for great support. Either way, the Drew Shoe Women’s Bloom II adjusts to every comfort level. Without a break-in period, you will want to leave these cute shoes on all day, every day. Women with an extremely high arch will want some extra support through an insert or a gel pod. While there is great traction on the bottom of the shoes, they don’t quite qualify as a non-slip sole. So, be careful when walking through wet, smooth areas. 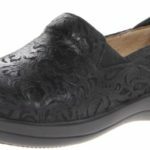 Although they are expensive for such a simple-looking shoe, the Drew Shoe Women’s Bloom II is a stylish and comfortable shoe for women of any age dealing with a sore Achilles tendon. Sometimes your Achilles tendinitis is so painful that you can’t bear any pressure on the outside of your heel. 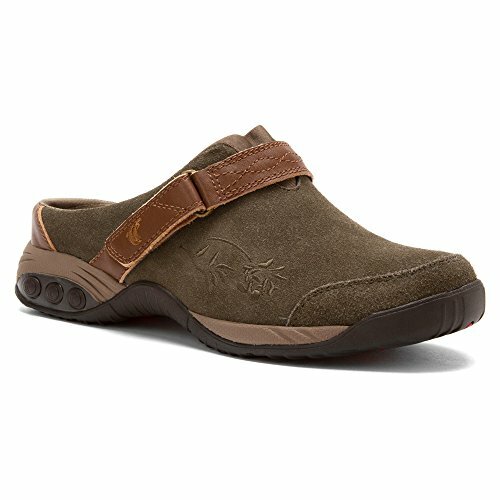 With a seven-layer Personalized Comfort System, the Therafit Shoe Women’s Austin Clog Slip-On Shoe is a favorite among women with problem feet. They have excellent arch support, allowing you to put more pressure on the ball of your foot when you are walking. This alleviates tension along your injury for quicker recovery time. The fabric interior and removable insoles with gel inserts keep your feet happy all day long, while the Aegis Microbe Shield prevents sweaty odors and bacteria. The adjustable hook and loop Velcro strap keep the clog secure to your midfoot, promoting your center of gravity forward to keep extra weight off of your heel. Podiatrists recommend the Austin Women’s White Clog Leather Slip-On for a variety of foot ailments, including Achilles tendinitis. The curve of the arch support is further back than on other shoes, correcting your heel placement for a better healing process. They do run small and narrow, so you should order a size up. Getting two sizes higher is a better idea if your feet swell after long periods of standing and walking. There is a moderate break-in period for the shoe to correct your gait. Unfortunately, one of the real downsides of the clog is that it squeaks on smooth surfaces. However, it doesn’t deter most buyers from this expensive clog that will help you heal faster! When you need a shoe for more comfort during your Achilles tendinitis, your options may be limited. Not every shoe will advertise its heel support, because more people suffer from ball of foot pain than heel pain. Any footwear with a well-defined heel that feels comfortable against the skin should be a good option for you. However, you also need good ball of foot support and a slight ankle to put you on your toes as you walk to keep weight off of your healing tendon. We recommend the Skechers Performance Men’s Go Walk 4 Incredible Walking Shoe and the Brooks Women’s Addiction Walker Walking Shoes for cases of Achilles tendinitis. The support in both shoes is perfect for sore heels, and they both provide the shock-absorption and rebound that you need to avoid further injury. If you are looking for a supportive and comfortable running shoe to wear during your Achilles tendinitis, don’t miss our article 10 Best Running Shoes for Achilles Tendinitis.